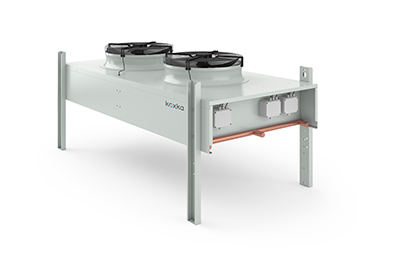 The Microchannel technology is based on a series of extremely thin flat tubes (microchannels), which provide significant savings in the use of refrigerant gas, both in the condenser, and throughout the cooling system. Additionally these capacitors have other significant advantages over capacitors using conventional batteries. Performance is higher, and they offer a greater durability and corrosion resistance, being easy to clean and much lighter in weight. This range features 13 models of Axial Condensers for industrial applications, available for cooling capacities from 9 to 254 kW. Factory equipped with high-efficiency EC fans.